One look at Post Tool Design’s work, and you realize the images they create, the on-screen events they produce and interactions they enable are pulled straight from the moments just before waking. There’s a gentle surrealism at work here, a sense of visual mystery and playfulness, a graphic appropriateness that defies logic. Roll the cursor around on screen and hummingbirds sing, an octopus disappears in a cloud of ink and you enter another world where traditional notions of interface design are left behind. The associations are free form; interactive multimedia as a Rorschach test. In the pursuit of surprise, mistakes are welcomed, even built in. In many commercial software releases, there are hidden areas called "Easter Eggs." Accessible only after hitting a highly unlikely series of keystrokes, these Easter Eggs reveal a clever animation or the name of the programmer who wrote that section of code. Post Tool Design’s work is one huge Easter Egg. The more the user explores, the more these hidden gifts reveal themselves. It is a virtuous circle in which Post Tool trains the user to do the unexpected, try the unexplored, then rewards them for doing so. In the process, Post Tool Design, led by founders Gigi Biederman and David Karam have moved to the forefront of design for interactive media. 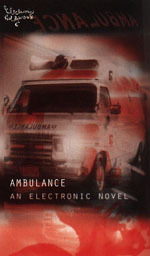 Disc cover for Ambulance, an interactive horror novel about a serial killer masquerading as an ambulance driver. David Karam/Gigi Biederman, designers/photocollagers; stock photography; Jaime Levy, client.